A record amount of property is currently under construction in Australia’s inner cities, and there are rising concerns about supply exceeding demand in some locations. The market is also facing tightening bank lending, and given that a significant proportion of demand has been from offshore, tightened capital outflow from China and increased foreign stamp duty may present further headwinds. Commercial property is meanwhile enjoy capitalisation rates that are close to cyclical highs, yet we have recently seen players like John Gandel cash in his chips on Charter Hall. To get some expert views on what investors could expect across residential, commercial and global property, Livewire reached out to four contributors to ask how they viewed current pricing, and what the greatest risk is in the market the operate in. 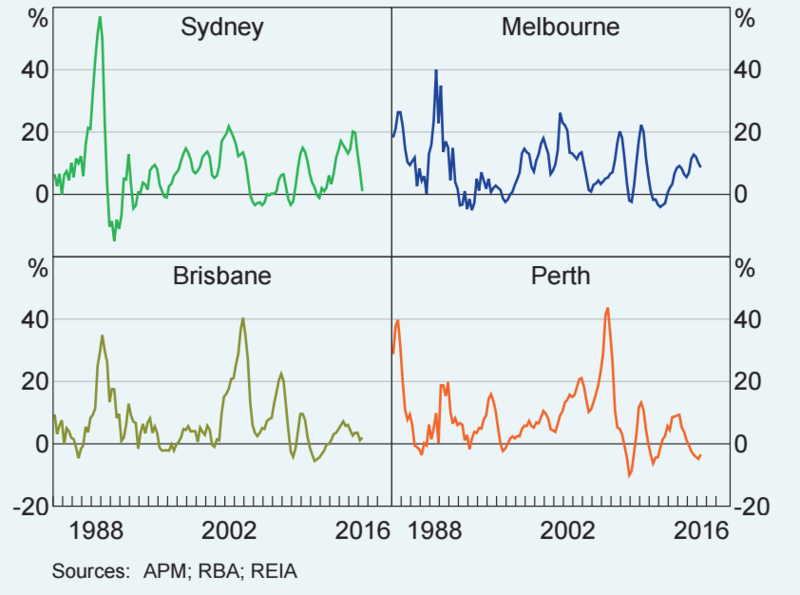 Australia’s capital city dwelling prices are expensive on most metrics in global terms, although it should be noted that the capital cities are at different stages in their respective cycles. The major risks are mainly to be found in the higher-density sector, with an all-time record of over 150,000 attached dwellings presently under construction. More specifically, there is significant concentration risk, with another new high of over 72,500 further dwellings of four or more storeys, approved over the year to July. The highest risk markets include the new apartment sectors in parts of inner city Melbourne and particularly Brisbane, where the re-zoning of commercial sites, combined with low interest rates, and record demand from China, has led to an explosion of apartments under construction. 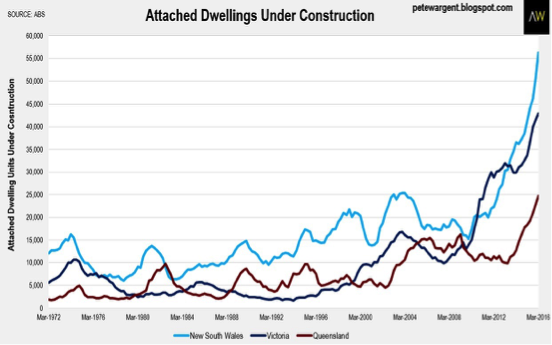 Sydney actually has the greatest number of attached dwellings under construction, but is playing catch-up from a period of under-building, and developments are spread more widely. Australia is very much a two-speed economy: East versus West. The same applies to residential property. Weakness in Perth is very much documented. On the East coast it is the opposite, and in general prices have been transacting above replacement cost. This has caused a massive supply response, well above long run averages, particularly in apartments. The risks are whether there will be enough demand to absorb this supply, particularly with the recent measures by State and Federal government agencies to increase taxes on foreign buyers, combined with tighter lending standards being imposed by the banks on domestic borrowers. If history is any guide, it is likely at that this supply response will cause price weakness. Time will tell whether this price weakness will be felt in the form of a correction, or a prolonged stagnation, and whether any weakness will spill over into other parts of the market. The average yield on commercial property was recently reported by MSCI at 6.2%, which presents a compelling return for Australian investors, but particularly foreign investors. The sector has thus seen strong inflows of capital from offshore, with 38% of last year’s deals involving a foreign party. Mark Pratt at Australian Unity told Livewire “as interest rates continue to fall, we continue to see weight of money pushing asset values up”. Although economic fundamentals may not be as strong in this cycle, the spread between the risk free rate, and the yield on commercial property, it is hard to see demand slow down. Mark told us: “I still think there is a little way to go in asset values going up”. Watch the video below to get the full view, and also hear about a few factors to be cautious of. In the residential markets there is no question that lower rates are encouraging the production of additional housing stock. In States which have a healthy take up like Sydney I can see the current valuation/pricing levels being maintained in the near future. In other States where supply exceeds demand I expect that prices will come under pressure. In all States, there will be exceptions, i.e. not every Sydney suburb will trend positively even if there is an over all upwards result.